Nearly two years ago, I did a guest post here by featuring 10 Linux-powered e-book readers (if you’re not yet familiar with e-book readers, I suggest you click that link first). Consider this an update of that post. But of course, this time, I’ll be introducing you to the latest of these devices. Just like before, I’m starting this list with the Amazon Kindle. 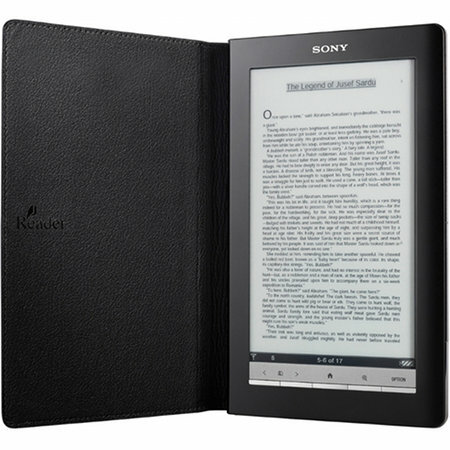 No Apple iPad it is, but when you talk about pure e-ink e-book readers, this tops them all in terms of popularity. 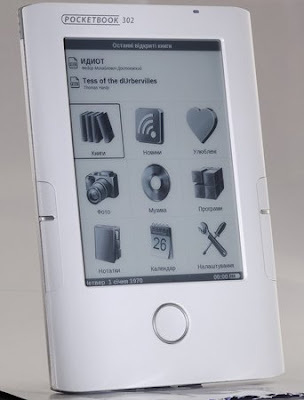 The latest generation of Amazon’s e-book reader is the Kindle DX International 2, which was released last July 1, 2010. Its 9.7-inch display is comparable to the iPad’s 10-inch. While the iPad can operate for 10-hours, this new Kindle can go for one whole week. Since it supports 3G wireless FOR FREE, you can access Amazon’s books practically anywhere - no need to look for Wi-Fi hotspots. A pure bookworm can still pick this over Steve Job’s “magical” device. There’s nothing wrong with the image below. The new Kindle DX International 2 now sports a graphite color. Although powered by Google’s Android OS, I’m still including this dual-screen e-book reader in this list. After all, the original Android was based on Linux. So what do I mean by “dual-screen”? 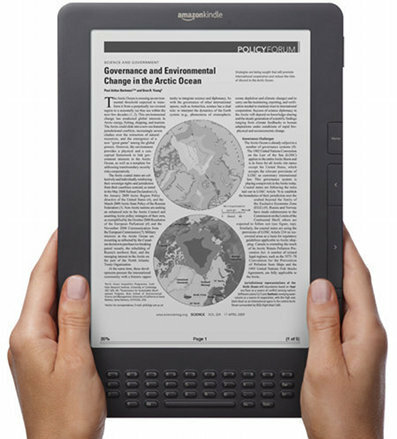 Well, some e-book reader manufacturers like Spring Design have recognized the advantages of a brightly-colored touch screen and the superior reading qualities of a gray-scale e-ink screen. Hence, Spring Design decided to put together these two screens into one device. 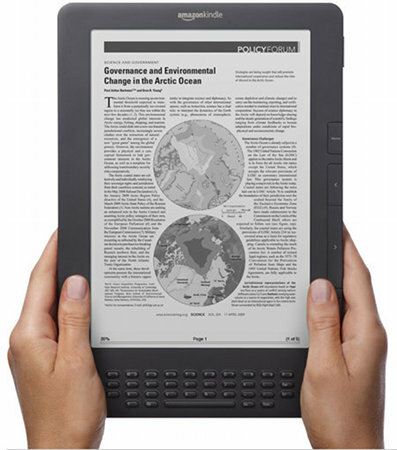 The 3.5-inch touchscreen LCD screen is for browsing, while the 6-inch e-ink display is for reading. Here’s another Android-powered dualbook (that’s how it prefers to call itself - and yes, it does look more like a book than just a dual-screen e-book reader). 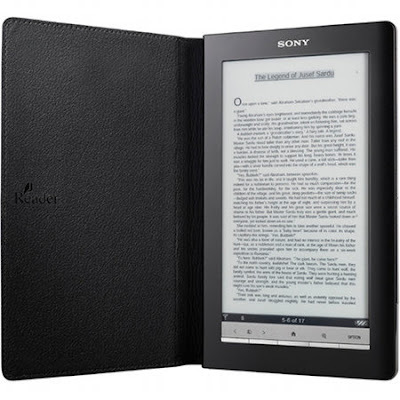 The eDGe has a 9.7-inch e-ink display on one side and a 10.1-inch LCD touchscreen display on the other. 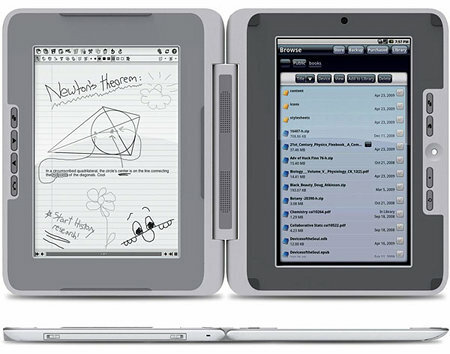 The enTourage eDGe can also be folded in such a way so that you can work solely on the touchscreen or the e-ink screen. 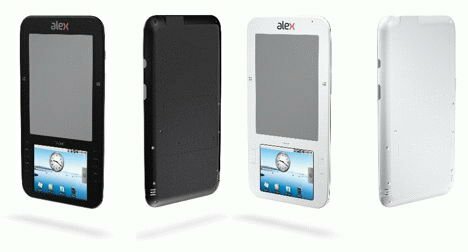 I’d like to insert this device into this list despite being released in December 2009 because aside from the fact that its release date is so close to 2010, it also supports a very revolutionary e-ink display that’s really worth mentioning here - it is already touch-sensitive. Although e-ink touch-screen displays are still in gray scale, they are obviously able to provide better navigational capabilities. By using the included stylus on the touch-sensitive screen, the user can easily jot down notes or highlight portions of text. Aside from that, Sony’s PRS-900 Reader is capable of receiving data over HSPA, UMTS, Edge, and even GPRS networks, giving the user superior mobility. With a battery life that can enable you to read 16,000 pages after a single charge, the PocketBook 302 easily outlasts all other e-book readers. For comparison, the usual battery life for these gadgets can only allow users to read about 8,000 pages. To give you an idea how long 16,000 pages can be, let’s just say you can read 1 page per minute (that’s really very fast for the average individual) and do so for 8 hours per day. That should translate to about 480 pages per day. Thus, the 16,000 pages can be consumed in 33 days or a little over a month. If that doesn’t blow you away, I don’t know what will. That’s it. Grab any of these e-book readers and add some zest to your learning this school year. I hope you enjoyed my list and hope to see you again in the next 2 years. Editor’s Note: John V wrote this article for Tech Source. I have an Entourage edge and it is terrific. It's not just an eReader, since it also runs Android. Most electronic toys just depreciate over time, but the edge keeps getting better, because the company is actively improving the software. Since its release there have been several free updates. It is on Android 1.6 now and will soon be on 2.1.